Abstract: Businesses have increasingly recognized their responsibility to respect human rights in their operations. This has been in part guided by international initiatives, such as the United Nations Guiding Principles on Business and Human Rights, as well as guidance and regulations from states. Although these measures recognize risks associated with conflict-affected areas, contexts of occupation present unique concerns. These issues become even more complex when states send mixed messages to businesses. This is most evident when examining the discourse on and regulation of business operations linked to Israel’s prolonged occupation of Palestinian territory, especially those with operations and relationships related to ‘security’. This article seeks to highlight the frequent disregard of human rights responsibilities and obligations by states and businesses related to the occupied Palestinian territory and population, which has created a gap in accountability that civil society has attempted to address. Abstract: This article examines the involvement of Private Military and Security Companies (PMSCs) in both shaping and implementing the European Agenda on Migration (European Agenda), launched by the European Union in May 2015. The migration policies which have since been adopted have increasingly enabled the outsourcing to private security contractors of various border control operations, including those related to forced returns, administrative detention and security services for the Italian and Greek ‘hotspots’. The article argues that PMSCs frame, shape and entrench militarized responses in the European Agenda. It also contends that the current context of the European refugee ‘crisis’ meets the conditions of a high-risk context, as understood within the United Nations Guiding Principles on Business and Human Rights (UNGPs). This re-definition of the refugee ‘crisis’ as a high-risk context, in turn, enables the identification of heightened human rights obligations of home states and responsibilities of companies when implementing the UNGPs. 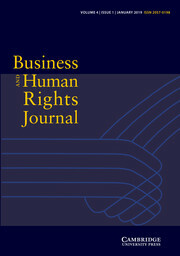 Abstract: The key purpose of this article is to critically assess the extent to which auditing and certification to quality assurance and risk management standards containing human rights-related requirements are an adequate and effective means of ensuring that private security companies internalize their responsibility to respect human rights. Based on participant observation, interviews and publicly accessible data, it concludes that in the absence of the adoption of specific assurance measures in the certification and oversight processes, the constructivist ‘tipping point’ resulting in the internalization of the corporate responsibility to respect may not be attained when there is inadequate norm compliance or, worse yet, norm regression. Abstract: The private security industry in Latin America has been associated with human rights abuses, particularly in the context of extractive operations. Most private security guards in the region are poorly trained and do not undergo adequate vetting. These factors combined with serious deficiencies in the rule of law across the region too often enable private security companies to effectively operate outside state control and engage in human rights abusive practices. This article argues that adoption of the International Code of Conduct for Private Security Providers (ICoC) by Latin American private security companies and states, coupled with civil society engagement with ICoC’s Association, may help reduce negative human rights impacts arising out of private security services within the extractive industry. Abstract: The history of indigenous peoples from across the globe is marked by constant aggression, persecution and conflict. In these times, they are being obliged to confront the consequences of economic interests in their ancestral lands and natural resources, which often take the form of extractive projects conducted by corporate actors with the permission of governments. These abusive practices have led to a number of social, legal and political disputes, many of which have resulted in violence. All of this reveals that indigenous rights cases cannot be omitted in the study of the interrelation between business, human rights and security, since these three elements are present in many of them. In particular, the case law of the Inter-American Court of Human Rights needs to be closely examined, as it is considered to be the regional system of human rights protection that has played the most prominent role in delimitating indigenous property rights.